When buying our Loose Boxes you can be confident you have purchased a unit manufactured to a very high standard, constructed to ensure an exceptionally long life as we only use the strongest topgrade best quality timber. 3.60 x 3.60m (12’ x 12’) " "
4.20m x 3.60m (14' x 12') " "
We offer free delivery and assembley to most areas. Please contact our Office 01833 650274 for further details. Framework - 75mm x 50mm (3" x 2") and 75mm x 75mm (3" x 3") with double thickness at section joints and corners. Exterior cladding is top quality 22m (7/8") tongued and grooved boarding. Extermal walls are treated externally with creoseal preservative. Constructed with top quality tongued and grooved boarding covered with heavy green mineral 35kg felt as standard. Alternative roofing felts or Onduline are also available. 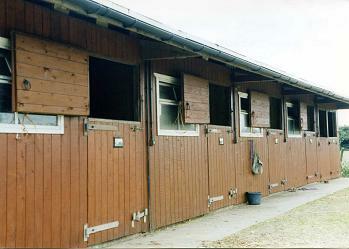 Standard on all boxes (except pony boxes) gives added protection to your horses. Complete with anti-bite strip fitted on the bottom door also to the top half of door jambs. Heavy duty 610mm (24") galvanised hook and band hinges, heavy galvanised kick over bolt, galvanised pad bolts, to the top door heavy japaned top door hooks to all stable doors as standard. Treated externally with creoseal preservative. Are joiner made 1.20m x 762mm (4’ x 2’ 6") with the top half opening inwards. Primed white and glazed. The whole window fitted with protection bars. The walls can be lined with 22mm (7/8") tongued and grooved boarding to 1.168 (3’ 10") high and fitted with anti bite strips or alternatively to eaves height. All sections are bolted together for extra strength, this also enables each unit to be easily dismantled and re-erected should you move address. Full colour brochure and price list can be forwarded by return, please do not hesitate to call our office on 01833 650274. ALL TIMBER SIZES ARE NOMINAL AND/OR TO CANADIAN LUMBER STANDARDS.